(right) instructs teachers on an shipboard teach-the-teacher cruise. Newark, NY; November 2, 2017. K-12 teachers and environmental educators now have a new resource for classroom-ready materials. The New York Great Lakes Ecosystem Education Exchange (NYGLEEE) provides hands-on, experiential learning opportunities focused on Great Lakes Literacy Principles and stewardship at www.nyseagrant.org/educationexchange. The new program was developed by New York Sea Grant in partnership with the New York State Department of Environmental Conservation. The program provides the clearinghouse website with teaching materials, service-learning strategies, and information on environmental careers, educational institutions and scholarships. NYGLEEE Basin Bins are available on loan with hands-on resources that may include a life-size replica of a Lake Sturgeon or a preserved Round Goby specimen, four classroom-ready activities, and a resource notebook stocked with fact sheets, articles, pamphlets and brochures on invasive species and native fish and wildlife. The NYGLEEE Great Lakes Model Educators Network unites K-12 educators for peer learning and professional development opportunities. "The New York Great Lakes Ecosystem Education Exchange project offers educators an easy-access point for issue-based learning materials and teacher-tested, hands-on classroom and field experiences that encourage localized stewardship to the benefit of communities and economies throughout the Great Lakes region in New York," said New York Sea Grant Associate Director Katherine Bunting-Howarth. NYGLEEE was developed with support from the Environmental Protection Fund. New York Sea Grant has been promoting coastal vitality, environmental sustainability, and citizen awareness about State freshwater and marine resources since 1971. New York Sea Grant has Great Lakes offices in Buffalo, Newark, and Oswego. 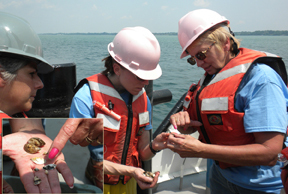 For updates on Sea Grant activities: www.nyseagrant.org, and connect on Facebook, Twitter and YouTube. 0 Comments to "K-12 Teachers: Find Classroom-Ready Resources at NY Great Lakes Ecosystem Education Exchange"